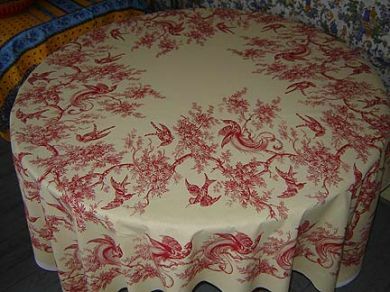 This 70'' square all cotton unfinished French tablecloth panel is a red toile on a butter yellow background with a bird motif. Hem it to make a beautiful tablecloth or incorporate it into a quilt to make something fabulous! A square cloth is perfect on round and square tables and can be wonderful as an accent table topper on rectangular tables.